There are days when I'm so full of words that I fervently type them on an iPhone note. There are also days when I have no words at all. Then there is the startling, overwhelming, amazing, fulfilling amount of time that caring for a baby takes. I have had no desire to write here for the past six months. I have had little to say about food except that I have managed to get dinner on the table...most nights. I am in awe of new mom's who seem to slip seamlessly back into their pre-baby lives. Evenings out with friends, restful nights of sleep, and perfectly coiffed hairstyles before they walk out the door (stylish diaper bag and baby with no snot on his face in tow). If you are one of those moms, hats off to you. If you are not one of those moms, I understand. Truly, I do. I am not one of those "together" moms. Is it okay to admit that these first six months have been challenging? The truths of new motherhood are easy to read about but much more difficult (and rewarding) to live. First, feeding a baby is a full time job; it is also the job I love most about being a mother. Second, dirty diapers wait for no man (or woman). They will make themselves known at awkward times and places. Thirdly, new motherhood can feel lonely (and scary) even though you are almost never alone. Isn't that the strangest dichotomy? And truly, I have an amazing, supportive, diaper changing, bottle washing, rock the baby at 2am husband who has made sure I was never alone in this. I can't imagine how much more difficult it would have been without him by my side. There is also the self-doubt. Did he have enough dirty diapers? Did I feed him two hours ago or three hours ago? Is it too chilly outside to dress him in short sleeves? Will he be scarred for life if I put him in his crib while I go take a shower? (My fellow mamas--put the baby down in a safe place and go take that shower! Do not feel guilty about that!) I'm fairly certain many mothers have these same feelings of falling short. It's easy to let our minds go to that place where we are not as good as the mom down the street or sitting a few rows in front of us at church. But here is the truth that we all need to hear: we are good moms. We can do this. We ARE doing it. This all brings me around to what is happening here on this little space I call my blog. Is this a food blog? A mom-blog? A blog about...anything in particular? I'm not sure. I am a person who cooks and eats food. I'm a mom. I like to garden, sew, needlepoint, read, and chat. I like to explore and I love to just be at home. I love my husband and my kids and my dogs. This blog may be about all of those things. I considered changing the name of it but as far as blogs go, I've been around a long time! Three years! Let's just push ahead here, together, mmkay? Today I do have some links to share with you. All of these links are from other mom's opening up about their thoughts on new motherhood (the good, the bad, the ugly, the beautiful). I hope if you are a mom, or thinking about being one, or know a mom who might need some support, you might find these writers relate-able. Motherhood Support is a wonderful parenting blog written by some Cincinnati mamas! Kath at KathEats shared tea and life thoughts in this post (I particularly related to her work-life balance. I also feel like every time Alex naps or is occupied I should be doing something like clean the house! answer email! fold the laundry! etc etc etc). New Mommy Media's podcasts sustained me during my maternity leave! I found myself counting down the days until new episodes were posted. I highly recommend them for any stage of parenthood from pre-conception to raising toddlers. Do you have any blogs, articles, podcasts, or experiences of your own to share? I'd love to hear them. Thank you for coming back here, even after all this time. I'll see you again, soon. We are growing some new plants this year. I even mustered up the courage to start a few things from seed. It's been very exciting to watch the garden mature these past few weeks. It was a wet and chilly spring in Cincinnati so we didn't get our garden planted until late May. 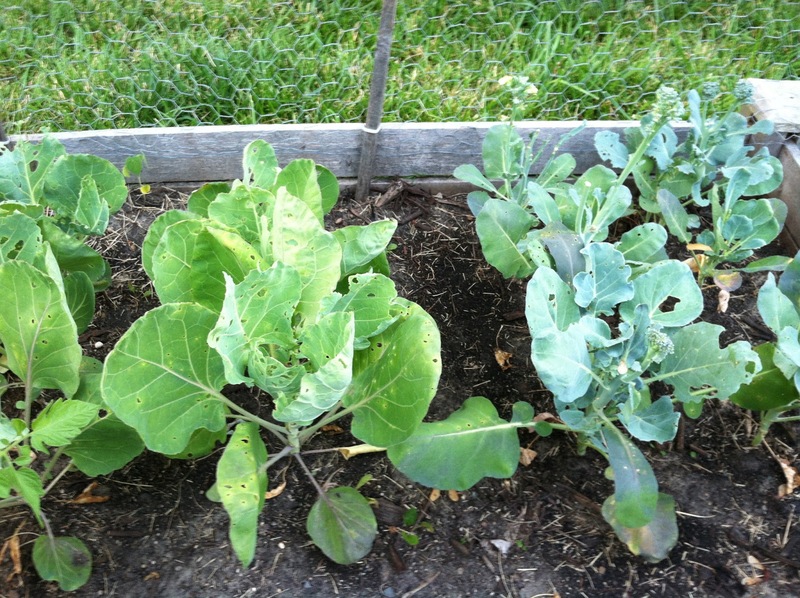 The late start has only been an issue for our broccoli plants; all six of them quickly bolted when the June temperatures jumped above 80 degrees. I haven't had the heart to yank them out of the garden yet but I am considering what I might be able to put in their place. 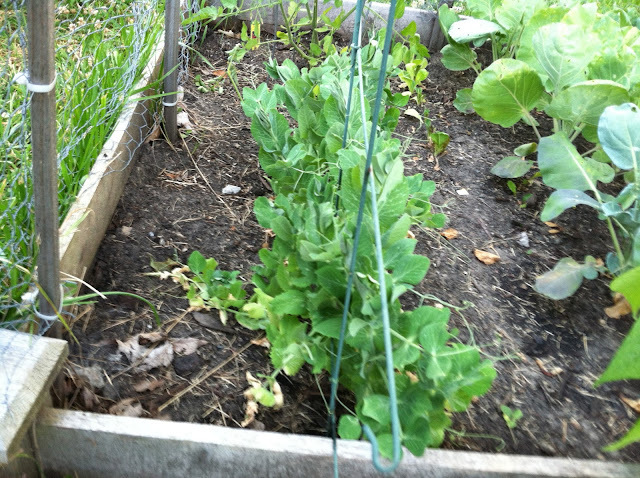 To the left of the broccoli, our Brussels sprouts seem to be doing fine and surviving despite the onslaught of insects chewing on their leaves. From seed we started bush beans, peas, and carrots! (Beans pictured above.) I'm extremely encouraged by how well they are all doing, even with the occasional garden invasion of rabbits or squirrels. The beans are much larger than I expected so I'm hoping that they have enough space. We have six bean plants and they all have buds on them. The pea plants have found their way to our makeshift trellis and starting to climb. I do have a confession to make: when I opened the seed package I was very surprised to find that pea seeds are...peas! I know, I know. Duh! You really learn a lot about your food when you grow it. We are growing only one lonely tomato. I doubt very many of these little guys will make it to our kitchen--Tim eats them right off the plant. 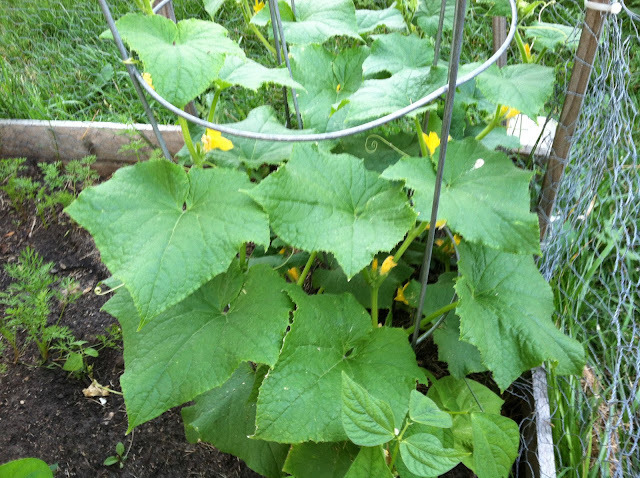 Because of our limited space (the fence around the perimeter is mostly to keep our dogs out of the garden but also rabbits), we are attempting to grow our cucumbers vertically. 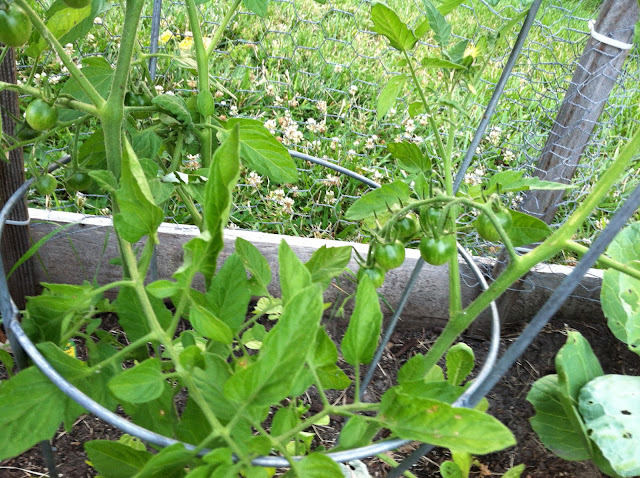 This experiment is doing fine so far as the little climbing tendrils are finding their way up our tomato cage. I'm not sure what will happen when the fruit begins to develop. This will definitely be a learning experience. My potted herbs are growing like weeds for the third year straight. I've harvested huge handfuls of chives, oregano (oh, so much oregano), thyme, and rosemary. 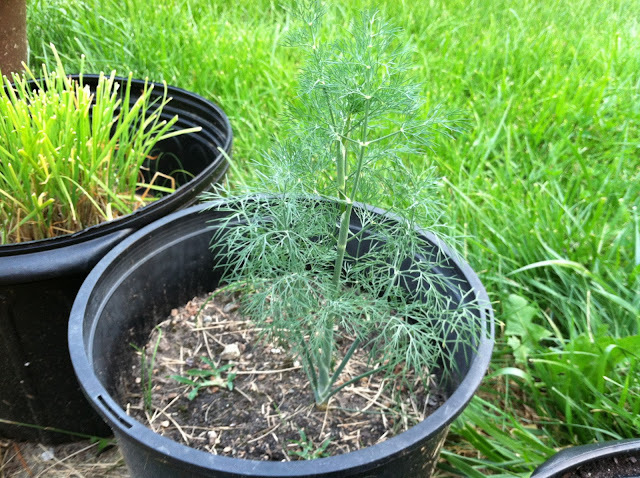 I have some sparse parsley, a healthy start to my dill, and my basil just didn't make it. If anyone has ideas on what to do with thyme and oregano, please share them with me. I have these two herbs in overwhelming excess! How is your garden growing this summer? And do you have any favorite gardening blogs to share with me? Last night I accompanied Tim to a work dinner at the Boathouse. When we arrived home, the sun had already set and a warm rain had just begun to fall. As I stepped out of the car, I opened my hands to feel the drops and a memory came back to me like lightening. The summer before Tim and I met was a bit of a low point for me. I wasn't entirely happy with my employment and I was lonely. I was still recovering from a broken heart that had lingered for over two years without healing; back then I had begun to wonder if I would ever feel happy again. One evening, I think it was a Thursday night, I came home from a work function after dark and stood next to my car in a warm August rain. It was like I was in some sort of trance, soon completely drenched, and I couldn't will any of my limbs to move. It was one of those strange moments where I felt outside myself, as if watching someone else contemplate how to fix all cracks in her life. I must have stood there for a half an hour while the rain fell until a car turned down the street and I snapped back to the present. I met Tim two months later. We married a little over two years after that. And now, three and a half years later, we are expecting a baby soon. I share all of this with you because every time the baby moves around, stretching his or her limbs, I can't believe how wonderful life can be. Even I can see all of the differences between the woman I am now and the girl I was back then. And as I approach my 30th birthday next week, I can whole-heartedly say good-bye to my 20s and all of the struggles and opportunities they presented me. Last August, I committed (publicly, on this blog!) to living out my 29th year like a Victory Lap, and I think I have spent this time proving to myself that my 20s were a battle well fought. What about you? Are you fighting for your life? I hope you win. You deserve it.